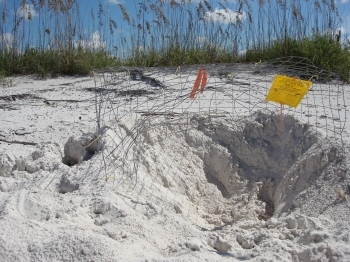 Summary: The Conservancy of Southwest Florida has been monitoring sea turtle nesting on Keewaydin Island for 25 years yielding a baseline of comparable data for 23 years. The project collects data on nesting females (loggerhead and green turtles), prevents nest depredation, conducts research as opportunities arise, and assists other researchers or graduate students in collaborative studies of the west coast rookeries. Nest depredation by raccoons and armadillos are managed successfully via caging since 1992. Prior to this approach, nest relocation to a hatchery (1985-1989) and flat screens (1990-1992) were utilized. Periodic sightings of feral hogs (Sus scrofa) foraging in the dune vegetation and along the beach were first noted in 2001. By 2006 nests were being routinely up rooted after they had hatched and been evaluated. In 2007 the first caged nest was destroyed. During the next 35 days, 48 of the 145 total nests were completely destroyed. Losses included approximately 3,200 hatchlings, long term data on the nest success of repeat-nesting females, nest temperature data loggers that went missing or were broken, and the project's capacity to conduct research effectively was compromised by the high levels of predation. A series of meetings with The Conservancy of Southwest Florida and Rookery Bay National Estuarine Research Reserve concluded that a realistic approach to feral hog abatement on the island would require aggressive steps to reduce the population. Beginning in mid-March and continuing through April a concerted effort will be made to remove as many hogs as possible prior to the start of the 2008 nesting season.